Premier Copper Products is your source for authentic and beautiful copper kitchen sinks of all shapes, sizes, and styles. Whether you’re looking for a professional galley style sink for your restaurant, or a new easy to maintain and artistic copper kitchen sink for your home, PremierCopperProducts.com has a large inventory of gorgeous copper sinks that will meet your needs. Apron sinks, also known as farm sinks, are intended for use in kitchens where the forward portion of the sink will be exposed to view and use. Our selection of traditional apron-style copper kitchen sinks provides an opportunity to show off a tremendous amount of artistry and personality, transforming your kitchen sink into a work of classical art. Available hand finished patterns and carvings on our apron sinks range from the smooth and clouded skin surfaces of our copper basin sinks to the ostentatious and striking fruit-and-vine design engraved into our single bowl vineyard sink. We also offer an original brick-like pattern on our Tuscan single bowl copper sink, and we have a sink adorned with the traditional Fleur-De-Lis design motif patterned across the apron. 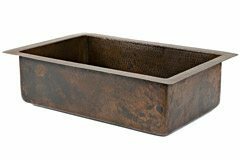 We have many other styles of engravings and finishes as well – be sure to browse our inventory to find the perfect apron style copper kitchen sink to accent your home or restaurant. Our traditional copper kitchen sinks are intended to be completely enveloped by your counter top – but don’t let that fool you! Our traditional line of copper kitchen sinks are every bit as artistic and authentic as our traditional copper apron sinks. 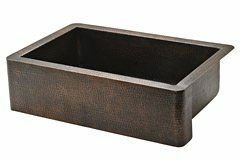 Our simple and elegant 25 inch single basin copper sink is a popular choice, and presents you with an entirely and completely unique sink texture and appearance. This is an excellent choice for smaller kitchens, or for use as a secondary sink in larger kitchens or restaurants. Our double basin traditional copper kitchen sinks are available in a wide range of choices, from a 50-50 split copper kitchen sink with two basins of identical size, to our 60-40 split that offers a slightly larger basin on either the left or the right hand side, to our 75-25 split that offers a single large basin with a smaller prep sink that can be situated to either the left or the right. All of these various sizes of copper kitchen sinks are available in a wide range of colors, textures, and finishes, allowing you to choose the perfect design and accent for your home or restaurant. But for the ultimate in copper kitchen sink style and utility, our 42 inch triple basin copper kitchen sink is a marvel to behold. A single prep sink measuring 8 wide inches by 17 inches long by 8 inches deep is bracketed on each side by a larger 15 inch wide by 20 in long by 10 inch deep basin-style sink. This triple basin copper kitchen sink provides all the space and versatility needed for a kitchen of any kind.